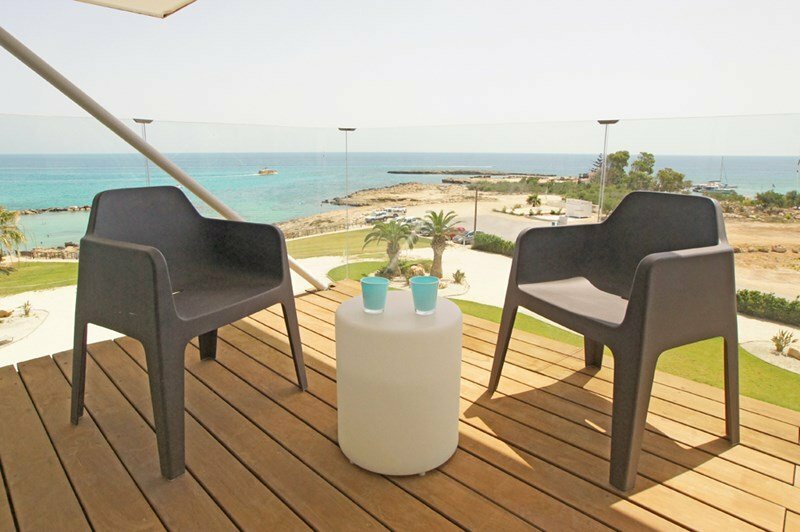 Beautiful one bedroom apartment with spectacular panoramic views from all rooms. The apartment is only few steps away from fabulous sandy Cavo mare beach with crystal clear water and short walk to Protaras main strip with its numerous bars, restaurants and entertainment facilities. In open-plan living room with balcony there are comfortable double sofa bed, satellite TV and DVD player. Fully equipped kitchen with fridge/freezer, cooker, microwave, toaster, kettle, washing machine, ironing facilities, oven, extractor fan & all cooking utensils. The bedroom is specious with a double bed and in built wardrobe and a shower bathroom. Apartment is air-conditioned through out and has spectacular, unobstructed sea views from all rooms. The apartment can easily accommodate 2 adults & 2 children or 3 adults. Outside there are large communal swimming pool, communal gardens and parking. High speed internet connection available free of charge at the restaurant near by or on request. All necessary bed linen and bath towels are provided free of charge. There is plenty to do for all ages and interests. Housekeeping and additional services are available on request. This lovely apartment is located in one of the most attractive resorts of Cyprus in Protaras. A couple of minutes walk to the bars, excellent taverns and restaurants, supermarkets, bank, kiosks and car hire rental offices. Larnaca airport is about 40 minutes drive from the apartment. There is a National Park Forest in the area at Cavo Creco, occupying an area of 390 hectares and offers facilities for hiking, picnicking, cycling, horse-riding, climbing, swimming and diving. Scenery and views in this area are some of the best on the island. The Protaras coast is a the family friendly coastline resort with its famous white sandy beaches and, in particular Fig Tree Bay where you can find activities such as snorkelling, jet-skiing, para-sailing plus Water world, where children can splash all day.